The Liebers: The Mother of All Meltdowns: Gift Idea and Giveaway! 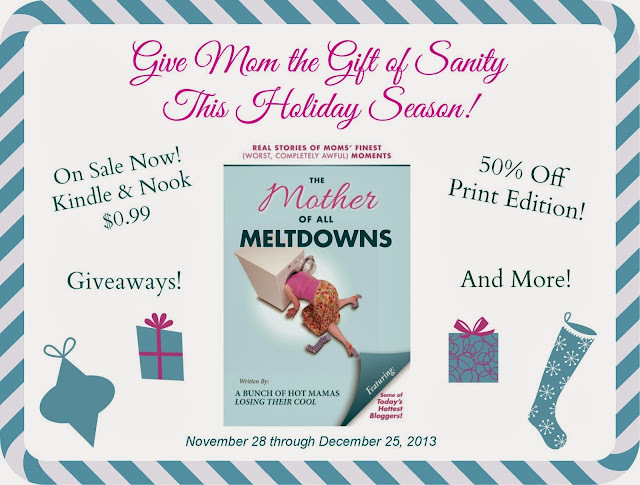 The Mother of All Meltdowns: Gift Idea and Giveaway! First of all, I have to say that it's a good thing that Bobby's job is to check up on the kids every day, and not tattle to Santa about what I've been doing!! Because what I've been doing might get me into a little bit of trouble. I've had a few meltdowns this year. OK, fine, more than a few! But there's only proof of a couple of them. And the proof of one of them is right here in this book! Have you bought your copy yet?!? Let me tell you, The Mother of All Meltdowns makes a great stocking stuffer or Christmas gift. Have a mom? Know a mom? Are you a mom? Thought about being a mom? If you know anyone who fits in to any of these categories, then this is a great book for them! And I've got great news! The Kindle and Nook versions have been dropped back to 99 cents from now until Christmas! You can also head over to our CreateSpace Store and order a print copy for half off! You will need the access code moam123 to log in and then you can use discount code 75N5ZSBR to reduce the price for a printed copy to $4.99. Still not sure? Why not head over to our blog and subscribe now for a chance to win free books and this awesome cocktail party set from Philosophy. We will be having random drawings every Wednesday between now and Christmas!